Farmers Insurance CEO Jeff Dailey presented the Armed Services YMCA San Diego with a donation of $30,000 on behalf of Farmers Insurance and its Board of Governors January 24 as part of the Farmers Insurance Open. 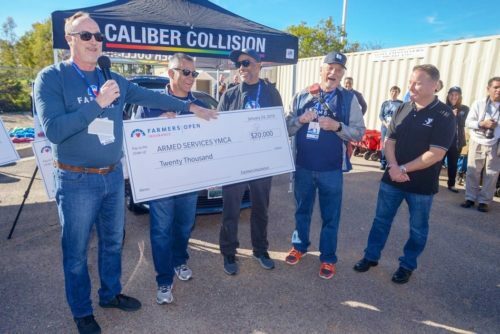 SAN DIEGO–(PRNewswire)– Farmers Insurance, an organization founded by two World War I veterans in 1928, celebrated San Diego’s military community by donating $30,000 to support the Armed Services YMCA San Diego and its mission, as well as a car to a local military family through the National Auto Body Council Recycled Ride program. Farmers executives, employees, agents and district managers also participated in the Armed Services YMCA’s monthly Neighborhood Food Exchange to help provide food and supplies for local military families. During a special morning ceremony on Thursday, Farmers presented a Camp Pendleton Marine with keys to a refurbished car, which was restored by technicians at a local area Caliber Collision Center in San Marcos who donated their time and talent to refurbish the vehicle as part of the NABC Recycled Rides Program. The Caliber team also engaged local businesses and contributed gifts, toys and certificates to “stuff the trunk” with additional surprises for the Marine and his family. The NABC Recycled Rides program began in 2007 and since then has donated more than 2,000 vehicles valued at $36 million. Founded in 1920, the Armed Services YMCA San Diego enhances the lives of military members and their families through specialized counseling, family and youth enrichment, and warrior care programs relevant to the unique challenges of military life.